We live in a resource limited world. How to determine the best allocation of resources has been a challenge for leaders and management since we evolved the ability to make choices. The “graded approach” is a management tool used to determine where to assign appropriate resources using a risk-based approach. In theory it seems pretty simple: The greater the risk the greater the amount of resources allocated in order to achieve a level of interventions sufficient to mitigate the risk or reduce it to an acceptable level. What does this have to do with instructional design? There is a continuum as to the rigor we can perform our tasks within the design process you use; ADDIE for example. The level of rigor can vary in the amount of documentation, involvement of others, and levels and number of approvals. The continuums expands from designing a course entirely by ourselves with not documentation, while on the other end of the continuum every step, every decision and every document is approved and maintained as an auditable, quality record with heavy stakeholder involvement ( Diagram of Possible Stakeholders ). By defining the level of rigor, you can make a better estimate of time and cost to complete a training project, better define your deliverables, and clarify expectations. At the very least it can’t hurt to be prepared with a methodology to help answer the question. Probability is a measure or estimation of how likely it is that something will happen or that a statement is true. The higher the degree of probability, the more likely the event is to happen. It helps me to think of probability in the context of two factors: history and prediction. That is, has it happened in the past and at what frequency, and what is the chance a consequence may happen? The goal is to determine an appropriate level of rigor to be applied during a training project based on a “graded approach” that will provide sufficient return on investment such that the training provided will enhance employee performance and impart an increase in event prevention. You can decide the level of rigor for the overall process or break it down to a level reasonable for your situation; for example, each phase of the ADDIE process (analysis, design, development, implementation or evaluation). The factor that has the greatest influence on time and resources is the level of involvement of the various stakeholders. This is a kind of balancing act because you need sufficient involvement to cover all your bases but, in general, the more stakeholders involved the increase of time and logistical effort. · Quantify the level of consequence. Determine a “consequence factor” based on the average of the numerical ratings assigned to the types of consequences. · Quantify the probability by selecting a numerical value from a chart. · Locate the “rigor value” on the Rigor Level Chart to find suggest application guidance. Please note: The instructional design tasks to be performed will vary based on the instructional design model you use and the rigor guidelines will change based on your specific work conditions. You can use the tables as created and/or modify them to represent the steps (tasks) in your process. It is usually prudent to involve resources such as interpretive authorities (IAs) subject matter experts (SMEs) and safety professionals for guidance and information about the potential consequences. 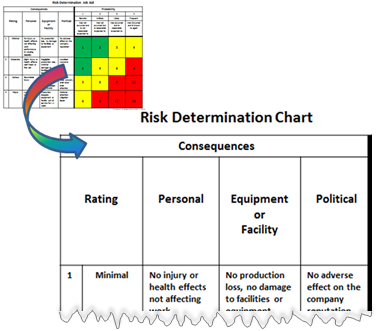 a) Applying reasoned judgment and weighing information from reliable source(s), select a rating value from the Risk Determination Chart ( Full Chart) for each consequence category (Personal, Equipment/Facility and Political). Using the descriptions of injury consequences what is the worst case scenario for an immediate event? · Is a production facility going to apply the training? · Is the training related to any safety systems or safety basis? · Is there a possibility of a release of hazardous substances (chemical/radiological)? · Is there a possibility of information of an event being directly fed to personnel outside of the organization? · Has an “event” related to the topic within the last 30 days? · Have there been recent (last couple of weeks) company safety bulletins, all employee messages, mandated briefings related to the topic? · Would an event make the local news broadcasts? · Would an event make national news broadcasts? · Could any laws been broken (state/federal)? b) Record the values in the Consequence Table below. c) Total the category values and record the total. d) Divide the category total by 3 and record the answer. This is the “consequence factor”. 2. Transfer the Consequence Factor into the Rigor Value Table below. 3. 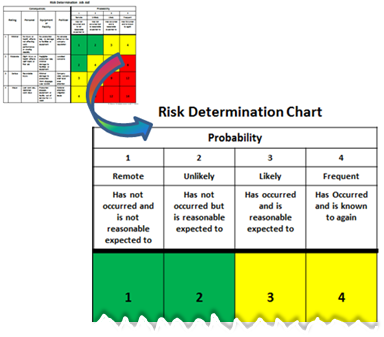 Quantify the Probability Factor from the Risk Determination Chart ( Full Chart) by considering the current barriers to prevent an event and the previous history of events, if any. 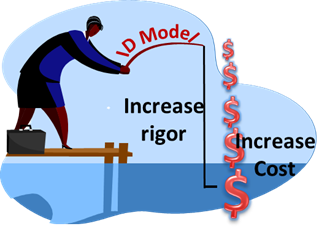 Insert the value into the Rigor Value Table below. Probability is affected by the quantity of past occurrences balanced with the change of future occurrences. · Have there been recent changes to the facility, procedures, or processes to prevent occurrences? 4. Determine the Graded Approach Rigor Value by multiplying the Consequence factor by the Probability factor. Using an appropriate Rigor Level Chart (Full Set of Charts) find the graded approach application guidelines based on your “rigor value” by locating the value in the top row. The guidelines for that value of risk are located in the column below. When making decisions that will impact the overall time and cost of a training project, I suggest getting management or client concurrence to implement the application guidelines. Whether or not you choose to use a systematic approach to determine the level of rigor to be applied in your design is in itself the application of a graded approach. Will it be worth the time and effort to implement a process? That is for you and your management to determine. It can be a good tool if you are bidding on a contract or negotiating the processes and end products of your efforts. Outside the world of academia, when having to answer to outside regulators and audits it can be a lifesaver when having to justify your process. In the limited-resource world we live in it can also be a vehicle to obtain the sufficient budget to support training excellence. I would like to thank Dr. Rick Zimmerman, a safety professional who I work with, for his guidance in developing the Risk Determination Chart. Great blog post, Thanks for sharing Toxic Release Inventory information. That is very useful to Environmental Management.